The Mail might be road-testing Rod Liddle as a replacement for the clapped out old banger that is Littlejohn. Yep. That's what I'm dreading. Although, would Greig want him? Would it be up to Greig? Littlejohn is supposedly trousering £600,000 from the Mail. I shouldn't think Liddle is getting more than a quarter of that. Littlejohn might well see his work as the journalistic equivalent of Gene Hunt firing up his red Audi Quattro twice a week but he's morphed into a Victor Meldrew and his purple Avenger. Grieg will be wanting to serve his master and the best way to do that is to make Rothermere richer and the best way to do that in the newspaper industry is to cut out the dead wood. He's such a weasel, isn't he. However, if a black person is shown in this manner then it harks back to black racist tropes of the 19th and early 20th century. See also the outrage against anyone of Jewish heritage who naturally sports a large nose and has a cartoon reminiscent of Nazi Germany. What to do? Treat blacks and Jews differently? Isn't that in itself divisive and perhaps condescending? If I was a cartoonist I'd steer clear of any subject that might include a black or a Jew and probably end up being called racist because I'm not depicting certain groups of people. I think it's the old issue of historical imbalance. Charicatures of black people were part of their inferior status, reinforcing the roles they were supposed to play, etc, thus a charicature of a black person today looks a helluva lot like one used 100+ years ago, when the role of black people was less contested, and more 'noble savage' or, well, 'savage'. 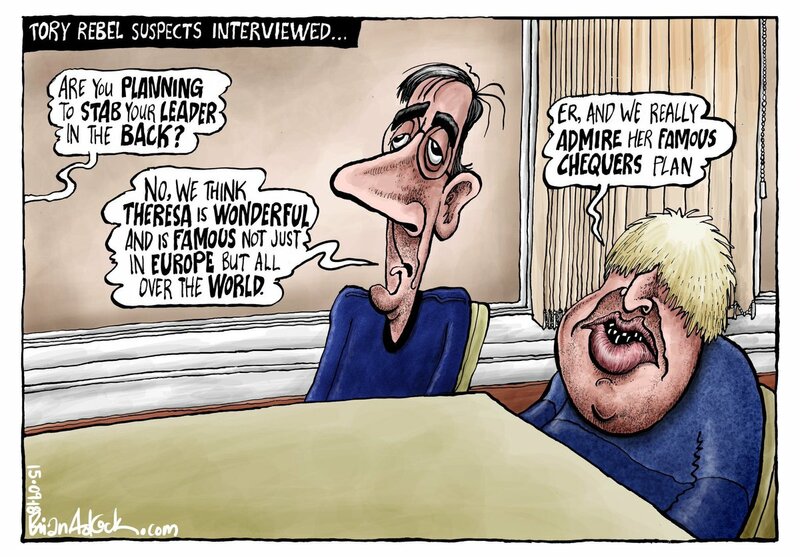 Charicatures of Boris and Rees-Mogg don't rest on a long history of similar imagery (of important, powerful, white men) being used to demean and subdue, but rather ridicule. Negotiating that as a cartoonist? Well, I got no clue, as you will necessarily be treating subjects differently. This ^, very much. All I would add is that none of us can undo the sins and injustices of the past but the least we can do is be sensitive to them. I agree with you 100% but how does a cartoonist ridicule someone who is black though? Looking back over Mac's cartoons, when he shows a real black person he is very careful to give an accurate line drawing of them, recognisable but no distorted features. On the other hand his depictions of racial groups, Muslims, Arabs, Asians are straight from Der Sturmer. Remember Muralgate when Corbyn made a comment that removing the mural was an attack on freedom of speech? Two of the four characters were Jewish (Rothschild was one of them). the other two were white American bankers who were also shown in a less than flattering way. This is a good twitter site that has copies of the latest political cartoons. The owner of the site has himself been drawn (literally) into the argument. You can ridicule without physical charicature, but if charicature is your style, I suspect you'll have a harder time. Apologies, Cycloon, but there is no "h" in "caricature". I'm afraid if I keep seeing it, I can't stay schtuum. I think the difference is that the caricatures of white people are exaggerating specific facial features/expressions of the target, not general racial characteristics. How to get around it? I dunno. Tell better jokes?